How can we move away from the dominating structure of whiteness as the way to liberation? That’s the continual question we ask at People of Colour Meditation group. Started in 2017, our current goal is is to grow the group and nurture it since it is one of the newer affinity groups at the Seattle Shambhala Center. The group is going strong, with weekly meetings at 1:00 pm, Sundays. We sit for 20 minutes, read from our chosen book, discuss, and enjoy snacks. We are close to finishing Radical Dharma by Rev. angel Kyodo williams, Lama Rod Owens, and Jasmine Syedullah. Our meetings have a healing quality. In the discussion of our reading we are able to validate each others experiences and listen deeply. Since our group makes most of our decisions together, we will decide in the next month what book we’d like to read next as well as if we’d like to change up the current model of our meetings. This is an important time for us. Please join in! For more information about the People of Color Meditation Group and resources, visit our landing page. Find us on the monthly calendar. Hello, is the POC group still going? I would love to participate. 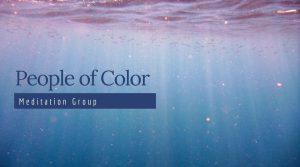 Hi Esther, the People of Color Meditation group is still going, and will meet again this Sunday at 1pm! You’re welcome to join in.